Eight O'Clock Decaf Office Coffee. The same quality classic roast and grind in the decaf version. 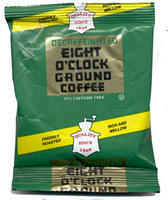 Packaged in a 42 count coffee service case, with 1.25 oz individually sealed packages of Eight O'Clock Coffee.